St. Croix is one of the U.S. Virgin Islands, which are considered an unincorporated U.S. territory. The beautiful island of St. Croix is the largest of the 3 inhabited US Virgins Islands (St. Thomas and St. John are the other two) and is 84 square miles. However, it only has a population of 55,000 residents. Christopher Columbus is said to have discovered the island in 1493, landing at Salt River on the north coast. The eastern part of the island is more arid than the western end of the island. You will even see large cactus plants on the East end. The East end has many beautiful sunny beaches and is favored by the "ex-pats" living on the island. The western half of St. Croix is quite different. It is verdant and lush, with beautiful green hills, a small rainforest, and wonderful white sandy beaches. Tourism is a growing and thriving part of life on St. Croix and tourists just love it and keep coming back, year after year! While tourism plays a major role in the island's economy, St Croix Hotels and Resorts have remained largely privately held. Villa and Condo rentals are plentiful on St. Croix and are a great alternative to a room at a hotel. 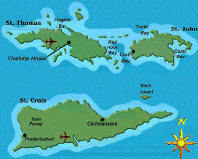 The two main towns are Christiansted and Frederiksted. Christiansted is on the northeast part of the island and is filled with historic Danish architecture. Frederiksted has charming "gingerbread" Victorian architecture. 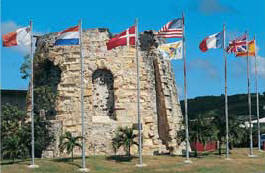 Fort Frederik dates back to 1700 and is the site where Governor General Peter Van Scholten read the proclamation abolishing slavery in 1848. Today it houses a museum. Frederiksted has a colorful harbor that draws cruise ships and people from around the world. For a good time, try to go to "Jump Up" (also known as Harbor Night) in Christiansted which is held several times a year. This "carnival-like" evening in Christiansted is filled with steel bands, dancing, local arts and crafts, food, and fun! Both towns have duty free shopping and great places to eat! St. Croix lies approximately 40 miles south of St. Thomas and St. John and is separated from them by a deep oceanic trench plunging down over 10,000 feet! St. Croix has beautiful sandy beaches. In fact, some of the best swimming, snorkeling, and diving to be found in the Caribbean is right here on St. Croix. Historic plantations from the days when agriculture drove the economy are scattered throughout the island. St Croix also has fine shopping areas and a variety of activities to keep tourists entertained. Among it's natural attributes are natural reserves for plant and animal life (Buck Island Reef National Monument with an underwater snorkeling trail), a rainforest, and botanical gardens. The Cruzan Rum factory is also based in St. Croix. St. Croix's currency is US Dollars. Most credit cards and travelers checks are accepted. No sales tax. The language is English, yet many locals also speak English with a Caribbean twist. For instance, the 'H' is often discarded ("thing" becomes "ting", and "thanks" becomes "tanks...mon"). The climate is subtropical with a year round average of about 78*F/26*C with easterly trade winds to help keep the humidity level comfortable. Seasonal temperatures fluctuate less than 10*F/6*C. Average annual rainfall is only 50 inches/1270 millimeters and occurs more in late spring and late summer. The island is more susceptible to potential hurricanes September - October. Electricity - the current and wall outlets are 110v/60 cycles, like those in the U.S. The water is safe to drink at most hotels and in town. Bottled water is preferred, but not entirely necessary elsewhere. St. Croix is on Atlantic Standard Time zone year-round (1 hour ahead of Eastern Standard Time). St. Croix has many festivals throughout the year, but any time is a great time to visit St. Croix. The current passport requirements DO NOT apply to U.S. citizens traveling to or returning directly from a U.S. territory. U.S. citizens returning directly from a U.S. territory are not considered to have left the United States and do not need to present a passport. U.S. territories include the following: Guam, Puerto Rico, the U.S. Virgin Islands, American Samoa, Swains Island, and the Commonwealth of the Northern Mariana Islands. The Intelligence Reform and Terrorism Prevention Act of 2004 requires the Department of Homeland Security and Department of State to develop and implement a plan to require all travelers, U.S. citizens and foreign nationals alike, to present a passport or other document, or a combination of documents, that denote identity and citizenship when entering the United States. Congress amended portions of the Act in 2006. The Western Hemisphere Travel Initiative is the Administration�s proposed plan to implement this mandate. The Western Hemisphere Travel Initiative (WHTI) will not affect travel between the United States and its territories. U.S. citizens traveling directly between the United States, Guam, Puerto Rico, the U.S. Virgin Islands, America Samoa, Swains Island and the Commonwealth of the Northern Mariana Islands will continue to be able to use established forms of identification to board flights and for entry. U.S. citizens need only a government issued photo ID to travel to/from the U.S. Virgin Islands. The U.S. Immigration and Naturalization Service maintains an office in St. Croix and is happy to assist visitors by answering any immigration questions. Their telephone number: (340) 778-6559. At the airport, their number is (340) 778-1419. When you leave St. Croix by air, give yourself at least an hour and a half at the airport to go through customs and immigration checkpoints. At the airline counter you will be required to show photo identification for security purposes, check your bags and you will be given a Customs Declarations form. Fill in the Customs Declaration form you were given at check-in and proceed to Customs. Present your declaration form, along with your passport. If you are a U.S. citizen and have not gone out of the U.S. Virgin Islands, you only need a valid, government issued I.D., such as a driver license. U.S. You then collect your bags from the luggage carousel and pass through Immigration where you present your identification and Customs Declaration form. Be prepared to have all your bags checked thoroughly, inside and out. Once past Customs and the airport screening area there are new gates with comfortable chairs and a small snack bar which serves light snacks, soft drinks, beer and cocktails. Driving is on the left side of the road! Rentals cars are all left hand drive models.